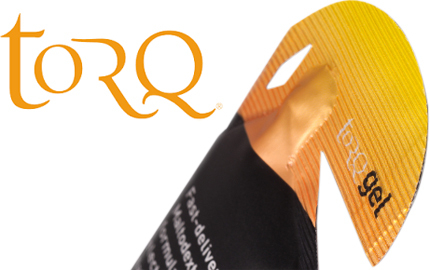 Using the same 2:1 ingredient ratio as other Torq products Torq Gels have a blend of Maltodextrin, a long chain complex carbohydrate and Fructose (fruit sugar) this means its absorbed easier and gentle on the stomach. Maltodextrin (43%), Water, Fructose (21%), Citric Acid, Electrolytes (Sodium Chloride, Potassium Chloride, Calcium Lactate, Magnesium Carbonate), Natural Yoghurt Flavour (0.2%), Natural Strawberry Flavour (0.05%), Preservative (Potassium Sorbate). Maltodextrin (43%), Water, Fructose (21%), Citric Acid, Electrolytes (Sodium Chloride, Potassium Chloride, Calcium Lactate, Magnesium Carbonate), Natural Yoghurt Flavour (0.2%), Natural Black Cherry Flavour (0.05%), Preservative (Potassium Sorbate). Torq Gel Sachets (15x45g) is rated 4.9 out of 5 by 59. Rated 5 out of 5 by Kurt78 from Dessert on the go! I appreciate that taste is entirely subjective but I've tried a million gels and these are head and shoulders above the rest! The energy delivery is nice but the taste is incredible! Just the thought of one of these gets you through a few miles! Rated 4 out of 5 by Mack05 from Great taste... Great tasting product, but not sure I get the energy boost as other gels I’ve used once taken. Rated 5 out of 5 by Lanzarote from Great taste Excellent product, does what it says on the packet. The bars will be only supplied in the same sachets and they do not offer a sachet selection box at the present time.